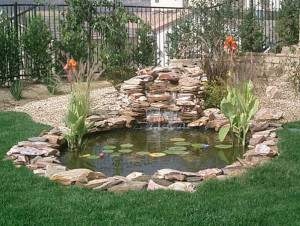 Whether it is backyard ponds or Koi ponds they are the cornerstone of any beautiful landscape. Especially if it features a waterfall. But what is the attraction? Waterfalls and streams capture the imagination and memories of perhaps a vacation or favorite hike. Maybe it is the feeling of being in nature gives us a feeling of peace and relaxation. But pond design is important. Remembering to keep everything to scale with your yard if you want your water garden to look like a natural pond. If you have a flat area don’t plan a 15’ waterfall. If you have a hill take full advantage of it. This residential pond construction project was in a completely flat yard. After it was decided where and how big the pond was to be we did the pond design. They wanted their Koi pond to be 14’ x 17’ and 2 ‘ deep with a 3’ waterfall. So we used a 20’ x 25’ Firestone Pond liner. This gave us plenty of room to go up the waterfall and under the rocks on the perimeter. It is always a good idea to use one liner for the complete project. This red sandstone rock looked very nice with the accents of the house. This is the nice advantage of having a custom pond builder, we were able to make it look like it was always there. 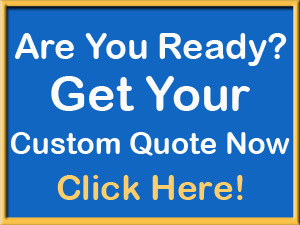 Koi ponds have some important issues that must be addressed when they are being constructed so make sure your pond contractor has knowledge of Koi and their special needs. There are many differences between a water garden, fish pond and a Koi pond. One is the size and type of pond pumps and pond filters. In this custom Koi pond construction we used a modified high pressure sand filter. It is nice as it can be installed as much as 50 feet from the pond site. We use mutli speed pond pumps to help pond owners to save money on energy consumption.